It’s still cheesy. It’s still cheesy. But it’s still good. I was actually talking about this drama earlier with my younger sister today and I told her that this drama was very cheesy and how it reminded me a lot of ‘Heirs’ and now the words she used ‘Heirs cheesy’ to describe ‘Her Lovely Heels’ is forever stuck in my mind. Because yes, ‘Her Lovely Heels’ is cheesy like ‘Heirs cheesy’, but it’s better than ‘Heirs.’ The only common thing between them is all the cheesiness. CHEEESSEEE. Episode 3 starts off with an anxious and panicky Ji-hoo putting back on her clothes (she woke up with just a tanktop on). Because she’s rushing, she’s careless of the noise she’s making so Tae-soo, who’s in the kitchen, assumes that she has awakened. Haha, he got you Ji-hoo! Ji-hoo steps out of the bedroom observing the living room, amazed and fascinated. As she looks around the living room, her eyes eventually land on Tae-soo who’s busy making breakfast. At the table, he hands her her bowl of ramen noodles and asks shortly afterwards on her condition after a whole night of drinking the night before. Ji-hoo reassures Tae-soo by saying that she’s fine, but her confession to Tae-soo is revived in her mind again which causes her to cringe in embarrassment. We are then brought back to the day of the gathering, after Ji-hoo has confessed to Tae-soo. He ends up carrying her on his back after her inability to walk any further and has to listen to Ji-hoo continually repeat that she likes him. Of course, Ji-hoo is drunk so she doesn’t know that she’s repeating herself, but that’s what happens when you’re drunk! Haha. As if things can’t get any worse for Ji-hoo, she ends up puking on Tae-soo. Poor Tae-soo. The flashback ends and we return to the current scene of Ji-hoo and Tae-soo joining each other for breakfast. Tae-soo notices that Ji-hoo has remembered what she did the night before which causes him to smile internally a bit. He also remembers Ji-hoo apologizing to him for liking him the night before. He can’t help but smile at Ji-hoo’s silly doings. After breakfast, Ji-hoo leaves Tae-soo’s apartment and hurries to the elevator. Tae-soo comes running after her and volunteers to take her home, but she denies his request – she has already bothered him enough. The elevator closes on them before Tae-soo can say anything else. Ji-hoo talks about her confessing to Tae-soo and sleeping the night at his house drunk to her best friend. Her best friend remains optimistic though and presents to her her perspective on the whole situation. She concludes by assuming that Tae-soo has feelings for Ji-hoo. A lot of feelings. But Ji-hoo doesn’t look too happy even with this news; she explains to her friend that she met Choi Yunho, her first love. Ji-hoo’s best friend Soo Young advises Ji-hoo to pretend like she doesn’t know him for now. Of course that one isn’t to Tae-soo’s satisfaction either so he doesn’t send it. 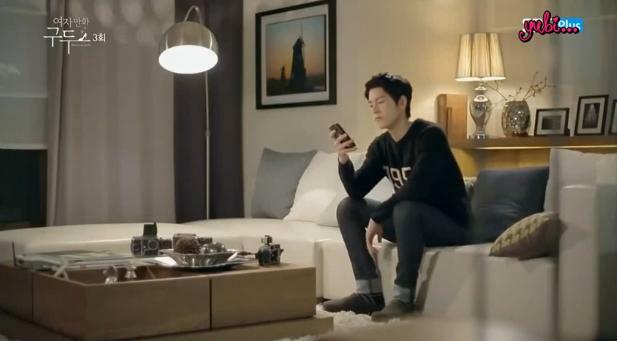 Instead, he goes to Ji-hoo’s SNS account and checks out her profile. He reads her status which says “damn embarassed” and clicks on her profile picture which is of a dog with ‘fake’ tears. He smiles in response to the picture. Ooh ooh ooh, I see you smiling there Oh Tae-soo. Tae-soo is at work waiting for the elevator to open when Ji-hoo is seen walking towards the elevator as well. However, once she sees Tae-soo near the elevators, she doesn’t hesitate to turn back and walk away. But it’s too late as Manager Im comes walking in to greet Ji-hoo and Tae-soo who’s not too far from the both of them. 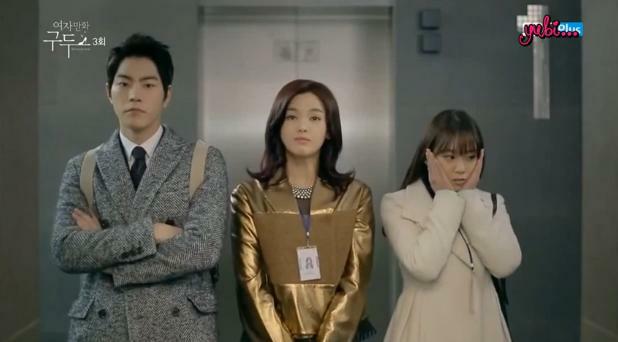 So in the end, the three of them, Tae-soo, Manager Im, and Ji-hoo, end up waiting for the elevators. Right when the elevator opens, Manager Im has to take a phone call so she motions for Tae-soo and Ji-hoo who are already in the elevator to head on first. It’s an awkward ride up as the neither of them say a word the first few seconds. However, Tae-soo hands Ji-hoo some band-aids for the scar she has on her hand before leaving the elevator. Manager Im asks Ji-hoo to show her the pictures she took for Ji-hoo’s scholarship project that he’s working on so she hands Manager Im the camera. Manager Im isn’t too impressed with these pictures and walks away empty-handed and disappointed. Tae-soo notices the rough situation that just took place between Manager Im and Ji-hoo. While walking down the hallway, an employee bumps into Ji-hoo who’s carrying a bunch of documents and papers, causing them to all splatter over the ground. While picking them up alone, she notices someone else helping her pick the papers up. That person turns out to be Yunho who came to the company office to attend a meeting with Manager Im. All the while, Tae-soo is inside his office, but catches Yunho and Ji-hoo conversing for a bit before Yunho leaves. Tae-soo, who was supposed to go out, changes his mind and decides to continue working. Manager Im, who’s actually there with Tae-soo, becomes suspicious of Tae-soo and asks for him to join her to a cup of coffee. After Tae-soo hands Manager Im her cup of coffee, she brings up the topic about what she had been most curious about. She knew that Ji-hoo had a crush on Tae-soo a long time back, but wonders if Tae-soo has any for her. The reason as to why she’s asking him this is because she has been noticing that Tae-soo has been staring at Ji-hoo a lot lately. But he is confident in that he has no intentions of dating Ji-hoo and do not possess any feelings for her at all. While they walk out of the room, we see Yunho walking in. He clenches his fists tightly; he’s heard everything that Tae-soo just told Manager Im right now. Yunho and Ji-hoo meet each other at a café. Ji-hoo explicitly reveals that she already has someone she likes so she doesn’t want to meet Yunho anymore, but Yunho has to warn her about Tae-soo. He explains to Ji-hoo the conversation he heard between Manager Im and Tae-soo back at the coffee room – about how Tae-soo stated that he had no intentions of dating Ji-hoo and did not have any interest in her. 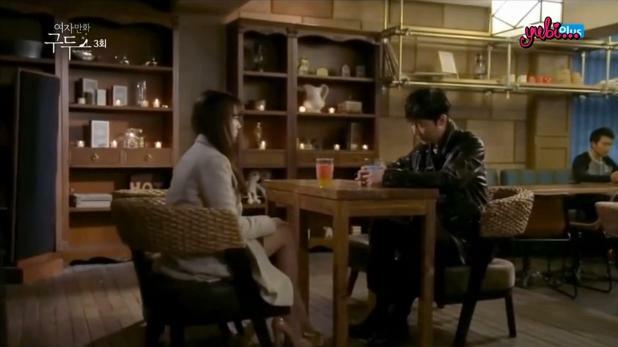 But even though Yunho tries to explain to Ji-hoo Tae-soo’s honest self, she isn’t willing to listen to him and walks out of the café. We then see not too far away an angry and frozen Tae-soo who had been watching Ji-hoo and Yunho this whole time. So the battle for Ji-hoo has officially started. This is going to be interesting. Especially because if Tae-soo fights for Ji-hoo, it’s going to be known to everyone that he does indeed have feelings for her and dating within the same company isn’t exactly allowed and looked upon positively. I hope this obstacle and problem is an issue that we’ll get to witness once Tae-soo and Ji-hoo do confront each other about their feelings – or at least after Tae-soo has because we all know what Ji-hoo thinks of Tae-soo. It would be interesting to see what Tae-soo and Ji-hoo are going to do once everyone finds out that they’re dating, especially when they work in the same company and the same department. Keke. I sometimes feel as if Yong Jong-hoon who plays Yunho in this drama is a bit too old and mature looking to play such a simplistic role. When I mean old, I don’t mean like he’s old, because he’s still a young guy, but I think his role of being Ji-hoo’s first love would suit a guy who is younger and looks younger. Someone like Kim Woo Bin (omg I can totally imagine him playing Yunho just because Yunho is similar to Young-do, but just not without any of the bullying or mean daddy). I like Yoon Jong-hoon, don’t misunderstand, I like him as actor, but when I see him with Kara’s Seungyeon and Hong Jong-hyun, he just stands out for the wrong reasons. Where are the idols when you need them?! Haha. It’s okay Yong Jong-hoon, I still love you.